All products are resistant to damage from moisture, mold and mildew. Find the right plan to transform your basement into the perfect space for you and your family to enjoy. 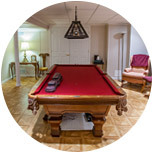 Our unique and comprehensive process will turn your basement into a beautiful finished space that lasts a lifetime. 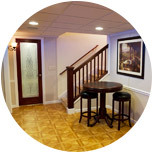 Learn what makes Total Basement Finishing the best basement finishing system available. Our complete line of Total Basement Finishing products gives you the option to customize while getting beauty, quality, and durability. If you're thinking about updating the interior or exterior of your home or you want to finish - or refinish - your basement, you've come to the right place. The Home Transformer of NY is a basement finishing and home remodeling specialist in New York. We offer quality products and workmanship to help you transform your basement; and improve your home with new windows or a new deck. If you're looking for an expert to help with your home improvement project, contact us today to schedule your free in-home design consultation at no obligation. 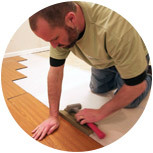 Call us at 1-845-692-6010 or click below to request an estimate! Are you looking to finish or remodel your basement? The Home Transformer of NY is your expert here in Middletown and Hudson Valley. Our basement finishing process is simple, risk-free and adds value to your home investment at nearly half the cost of adding on a room. Schedule a no-obligation, free consultation and estimate. Our company representative will schedule a visit to your home and work with you to design your dream basement using a custom 3D software program. If you're looking to install replacement windows or doors or a new deck, your specialist will discuss your wishlist with you and figure out all the details of your project. We will provide you with a detailed proposal before any work begins on your home. For answers to your questions or to get a free estimate, contact The Home Transformer of NY today. We work in Middletown, Poughkeepsie, New City, Wallkill, New Windsor, Spring Valley, Hopewell Junction, Nanuet, Hyde Park, Blooming Grove, and surrounding areas in New York.